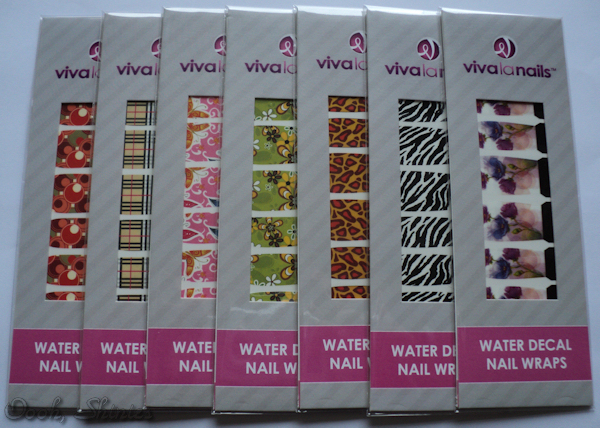 This weekend I received a package with the new Water Decal Nail Wraps from Viva La Nails. It's rainy today, so a perfect time to try them out with a nice cup of tea and a warm cat on my lap :) The pictures aren't fully color accurate though, with all the recent sunshine I slacked with buying a new lightbox lamp. I received 8 different images, here are 7 of them, number 8 is on my nails. 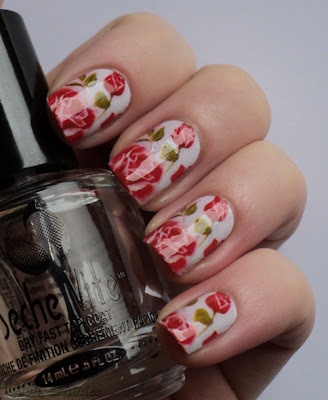 There are 39 different images you can choose from, some with the same image on each nail, some with a slightly different image (like the pink one above, the butterflies fly over your nails). 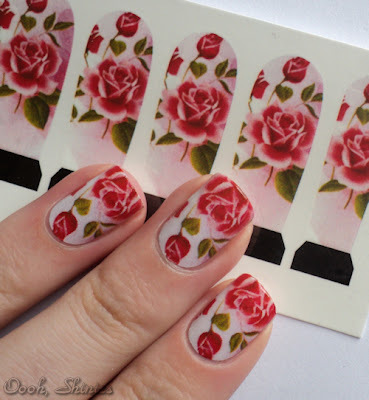 Each package contains 10 decals, in 3 different sizes (thumb, index-middle-ring, pinkie). This is what the package says about how to apply them. I wasn't sure what it ment with the quick manicure, so I went for basecoat only. I didn't use an orangestick but used my fingers to pick up the decals, that works fine too. You can easily move them around then and gently press out air bubbles, as long as your fingers are slightly wet. Here you can see the size of the decals well, they're pretty large! The black tip is handy for holding them, although with the length of my nails I could use the excess decal for that as well. The rounded part and the width of the decals was the right size for my nails, but I did have a problem on some nails though. The tip of those nails is a bit more rounded than the base of my nails, which means I couldn't easily get them flat on without bubbles in it. On my thumb it was the worst, but I solved it by making a small cut in the decal at the tip. Waiting for the decals to dry completely took the most time of the whole application. 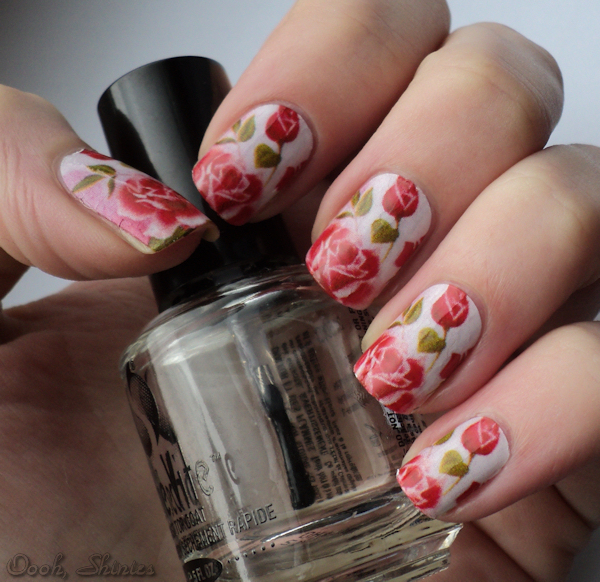 I used top coat before filing off the excess decal at my tips, and then wrapped my tips with top coat. The top coat didn't smudge the images at all, but it could've used another coat because I like my nails as smooth as possible. I think the result is pretty cute! 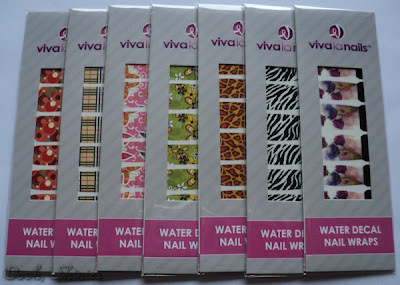 But I wouldn't use these often though, I enjoy stamping too much and I found the application a bit of a hassle compared to my usual manicures. Although it was handy that I didn't have to do a cleanup! The decals cost £2.95 per set, and here you can see them all.